A large area of showers and storms associated with an upper air low has persisted for several days. The low is gaining some tropical characteristics and will likely become a subtropical storm by the next 24 hours. The low is currently several hundred miles north of the Virgin Islands and well south of Bermuda. It is forecast to move north. 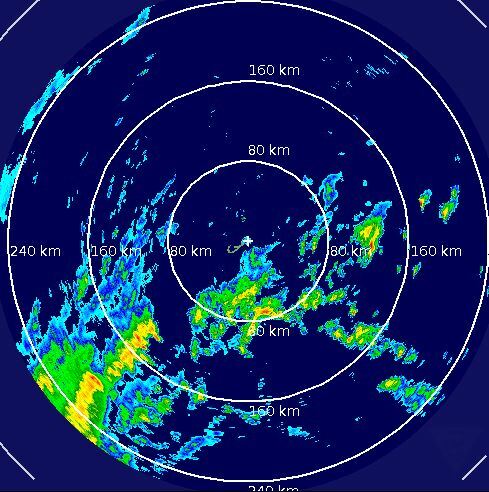 A circulation is developing well south of Bermuda this morning. It looks to now be a subtropical storm. The hurricane center is a little shy about naming this one, but expect that they will later today. Forecasts take it south of Bermuda with the closest pass Saturday night / Sunday morning. Showers and storms associated with an upper air low have now organized enough to classify subtropical depression 7. Bermuda will see increasing southerly swell and unsettled weather. A hurricane hunter plane will investigate later today and likely find strong enough winds to upgrade to a tropical storm. As of 11 AM EDT / 11 AM AST Subtropical depression 7 was centered at 23.8 N / 63.7 W or about 590 miles south of Bermuda. It was moving NW at about 10 mph. Top sustained winds are estimated at 35 mph. Pressure was estimated at 1005 mb. Subtropical depression 7 will continue to move northward toward Bermuda before recurving to the northeast. It will come closest to Bermuda Saturday night and Sunday morning. The hurricane hunter reconnaissance aircraft found a strong enough circulation and winds to upgrade to subtropical storm Deep convection has built around the low center allowing for some strengthening. Strong southerly wind shear will prevent significant strengthening. Fay will merge with a cold front in about three days. 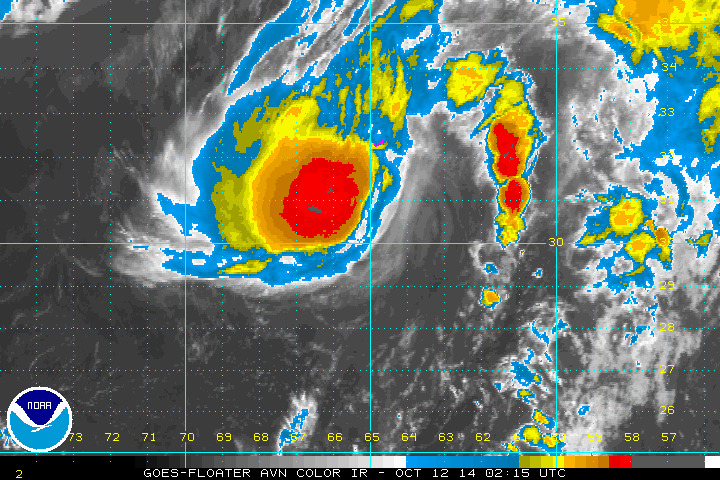 As of 5 PM EDT / 5 PM AST Subtropical storm Fay was centered at 24.7 N / 64.2 W or about 525 miles south of Bermuda. It was moving NNW at about 12 mph. Top sustained winds are estimated at 40 mph. Pressure was estimated at 1002 mb. Subtropical strom Fay will continue to move northward toward Bermuda before recurving to the northeast. It will come closest to Bermuda Saturday night and Sunday morning. Fay has become a tropical system as deep convection has wrapped around its center of circulation. Southeasterly wind shear is keeping the strongest storms to the northwest side of the circulation. 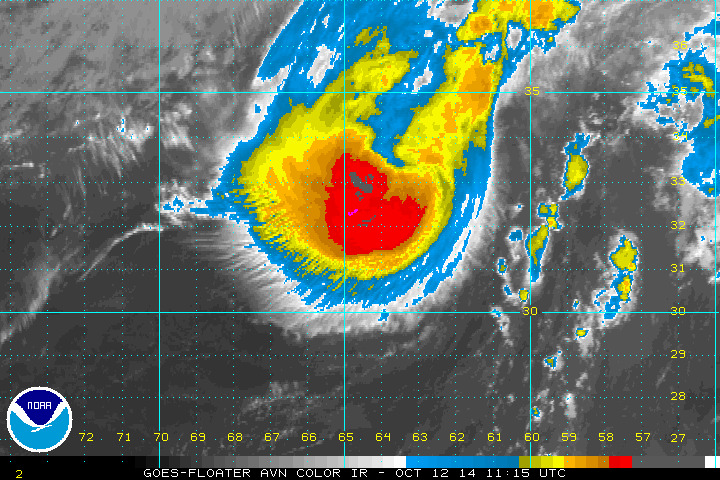 As of 11 AM EDT / 11 AM AST Tropical storm Fay was centered at 27.9 N / 65.3 W or about 305 miles south of Bermuda. It was moving north at about 16 mph. Top sustained winds are estimated at 70 mph. Pressure was estimated at 991 mb. Tropical storm Fay will continue to move northward today and turn just before reaching Bermuda tonight. Breezes will pick up late this afternoon. Gusts to tropical storm strength will occur tonight. It will quickly move away from the area tomorrow. Fay is closing in on Bermuda and winds will pick up this evening. Winds will remain strong tonight and slacken later on Sunday. Heavy rain will set in by around midnight. As of 5 PM EDT / 5 PM AST Tropical storm Fay was centered at 29.5 N / 65.4 W or about 195 miles south of Bermuda. It was moving north at about 18 mph. Top sustained winds are estimated at 70 mph. Pressure was estimated at 990 mb. Tropical storm Fay will brush by Bermuda during the middle of the night tonight. Tropical storm force winds will be seen with a few gusts to near hurricane force possible. It will quickly move away from the area tomorrow. Winds have started increasing over the past two hours on Bermuda. Winds currently are 30 mph with higher gusts. The strongest winds are in thunderstorms on the northwest side of the storm. Those storms will move over the area in the middle of the night. Some gusts may be in the 60-70 mph range as Fay passes to the southeast. 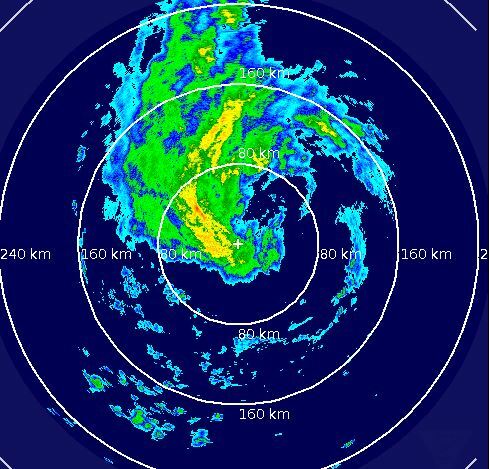 As of 11 PM EDT / 11 PM AST Tropical storm Fay was centered at 30.9 N / 65.0 W or about 95 miles south of Bermuda. It was moving north at about 17 mph. Top sustained winds are estimated at 70 mph. Pressure was estimated at 989 mb. Fay passed over Bermuda before daybreak around 4 AM. Winds were sustained at 61 MPH early this morning with a wind gust to 82 MPH. Heavy rainfall has diminished, but a few heavy rain bands may affect the island this morning. Winds will rapidly die down by this afternoon. As of 8 AM EDT / 8 AM AST Tropical storm Fay was centered at 33.4 N / 63.9 W or about 85 miles NNE of Bermuda. It was moving NNE at about 20 mph. Top sustained winds are estimated at 70 mph. Pressure was estimated at 986 mb. 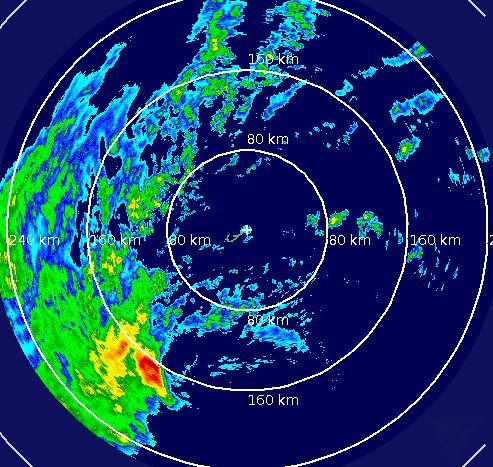 Tropical storm Fay will rapidly move away from Bermuda today with diminishing winds and improving weather. It will become extratropical during the next 24 hours. Winds are now down to 30 mph on Bermuda with improving weather. Fay is rapidly moving toward the northern north Atlantic and will become extratropical soon. This will be the last update on Fay. Fay was upgraded to a minimal hurricane at 5 pm Sunday. This looks like a stretch considering the satellite imagery. It is predicted to become extratropical within 24 hours. It's well on its way now.